As a homeowner, you understand that having the worst lawn on the block is not good. When your yard is damaged, it can be quite hard and downright intimidating to nurse it back to health. You can easily spend hours upon hours doing the research on how you are possibly ruining your lawn. From your soil’s pH balance to the right fertilizer, there is no shortage of tips and tricks on the Internet that can help with your lawn and landscaping maintenance. However, sometimes just looking at your grass can tell you what is actually ruining it. The Problem: While dandelions can be fun for kids to play with, they are actually a sign that your lawn has a lot of foot traffic and could you soil is low in calcium. The Solution: To prevent dandelion from popping up in your lawn, you will need to de-thatch and aerate your lawn annually. How it Works: Thatch is a common part of your lawn, however too thick of a thatch can prevent your grass from getting the nutrients it needs to grow. With dethatching, you will need to pull a convex rake through your grass. With aerating, you will use an aerating tool that has spikes on the end. This works to release your soil that may be compact and thus not getting nutrients it needs. This should ideally be done in the spring or summer while detaching should be done in fall or winter. The Problem: Crabgrass may look like something that is normal, however, it is not. Crabgrass is actually a tell-tale sign that your grass was cut too short. The Solution: The obvious solution is to raise up your mower blades. Another great tip is to use a pre-emergent herbicide. How it Works: Since crabgrass competes with your grass when it is cut too low, using pre-emergent herbicide will help because it releases a key enzyme that prevents new crabgrass from germinating. 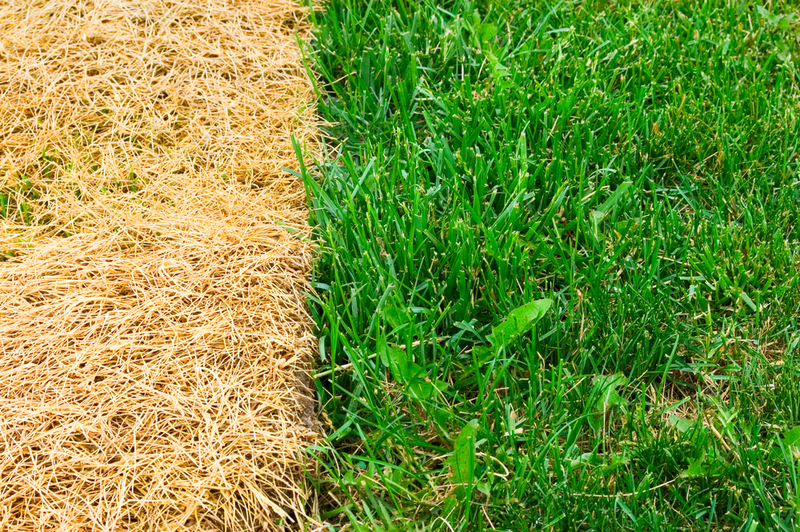 The Problem: Not only is yellow grass an eyesore, but it is also a sign that your lawn is actually iron deficient. The Solution: If you have yellow spots in your yard, try watering it less and putting out sulfur. How It Works: Watering your grass too much can not only drown your roots but can also result in a lack of oxygen to the grass roots. With sulfur, it works to lock in the key nutrients your grass and soil needs to flourish. The Problem: Brown grass is a surefire way to get an award for the “Ugliest Yard on the Block”. It is also a way to tell that your yard may have a fungus that prospers in heat and humidity. The Solution: Watering your grass early in the morning and avoid using fertilizer if possible. How It Works: Watering your lawn in the heat of the day only provides fungi a warm habitat to grow. It also can cause your grass to burn which too can result in brown grass or brown spots. Are experiencing any of these issues with your lawn? Well, you don’t have to fight against them alone. At Yepez Maintenance Service, we have over 25 years of experience and can help you get you lawn back healthy. Contact Yepez Maintenance Service today to get started!